Established in 1969, Paesanos is celebrating 50 years of feeding San Antonio. An iconic Italian restaurant with 3 locations, River Walk, Lincoln Heights and 1604 plus spaces for private dining make Paesanos a local favorite. A gift card from Paesanos is sure to please anyone. 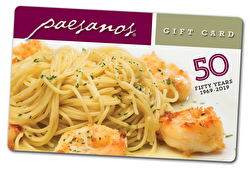 Paesanos gift cards are honored at all locations, as well as Rio Rio Cantina on the River Walk. Best of all, Paesanos gift cards never expire. Paesanos Restaurant Group gift cards do not expire and cannot be redeemed for cash. For balance inquiries call the phone number to a Paesanos Restaurant Group's location below.